The ninth edition of Music in Theory and Practice has been revised to eliminate as many awkward page turns and cross-references as possible. A series of pedagogical “practice” instructions have been added to guide students through their initial efforts at understanding concepts. Several new full-length compositions have been added to allow students additional opportunity to study complete works rather than isolated sections of a composition. Recordings posted online for this edition of Music in Theory and Practice are identified throughout the texts and workbooks with the following graphic: ♫. New, easily accessible recordings: audio files for the main texts and workbooks are now available on the Music in Theory and Practice Online Learning Center; eliminating the need for CDs and making the music easily accessible online. Two-Volume Format: The two volumes provide a complete basis for the study of music theory. Each spiral-bound volume maintains an outline that ensures conciseness, efficiency, and ease in locating specific topics. Thorough and Comprehensive Coverage: Music in Theory and Practice includes a thorough study of the fundamentals of music and the structural elements of melody, rhythm, and texture. In this way, the authors hope to present a more balanced view of the structure of music, rather than concentrating exclusively on harmony and voice leading. Historical perspective: Each chapter includes a short section labeled "History" which relates the top at hand to the history of music. A brief overview of music history and its relation to European and American history is included in appendix D.
Integrated teaching and learning package: This textbook is a part of a carefully integrated package. An instructor's manual accompanies each volume. It offers helpful hints in presenting class material and answers to objective text assignments. Two workbook/anthologies for students and solutions manuals for those workbook/anthologies are also available. Encoded musical examples throughout the text include ample workspace and staff-size adjustments to facilitate student work. Assignment sections for both volumes of the Music in Theory and Practice textbook provide additional practice materials for students. The course-tested assignments are appropriate for both in-class study and homework. Wide-ranging musical examples included throughout the two volumes, which features music from the Renaissance to the contemporary period. The text integrates a study of jazz and popular music, which is indigenous to American culture, into the traditional study of European art music. Macro analysis, which enhances student perception, has been fully integrated into both volumes in this edition. 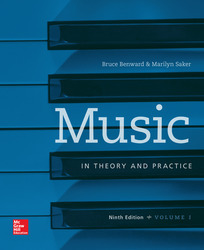 Recordings accompany each of the textbooks for this edition of Music in Theory and Practice.